There are many people in the universe who are fans of hedge fund manager Bill Ackman. They like his style. His charm. The way he makes them feel. The fact that he&apos;s not afraid to show his emotions or give them an honest opinion about their new dress or say "You know what? Those highlights really aren&apos;t working for you." Carl Icahn, however, is not one of those people. Save for a fleeting moment of supposed amicability following "a lengthy, boozy dinner," Icahn has viewed Ackman as a punk for nearly a decade; an untrustworthy little jerk who Ichan&apos;s friends supposedly told him not to do business with. (The feeling being more than a little mutual; as Ackman has put it, "The guy is a shakedown artist. His word is worthless.”) Anyway, in case anyone was wondering if the investors had put an end to their feud with another long, booze-filled meal, wonder no longer. In an interview with Bloomberg TV this afternoon, Icahn updated anchor Trish Regan on the current state of their relationship and, spoiler alert, he still hates the guy, though apparently that made no impact on his decision to take a long position in Herbalife, which he&apos;s not saying he did and not saying he didn&apos;t ("I stay away from commenting on positions that we have or we don&apos;t have if they don&apos;t have a 13D on file. I will duck that question and not say yes and not say no"). 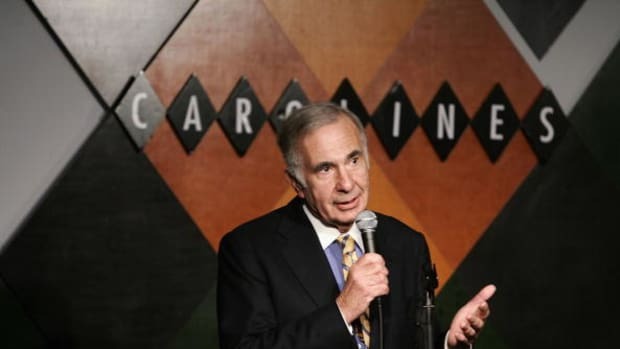 "Look, it&apos;s no secret to the world and to Wall Street - and most guys on Wall Street I sort of like and I get along with - and it&apos;s no secret I don&apos;t like Ackman. I have no respect for him and I don&apos;t like him and that&apos;s not a secret. But that doesn’t mean that I&apos;m going to go in and buy stock in a company necessarily just to get him. Frankly, I don&apos;t like the way he did this anyway. If you&apos;re short, you go short and hey, if it goes down you make money. You don&apos;t go out and get a roomful of people to badmouth the company. If you want to be in that business, why don&apos;t you go out and join the SEC? [...] I wouldn&apos;t even say this, but it&apos;s no secret, I dislike the guy, I don&apos;t respect him, I&apos;ve done business with him and he wasn&apos;t forthright…that&apos;s my opinion…But the real thing is, I don&apos;t think he did this in the right way."